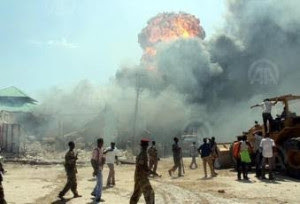 16 people died in the early hours of today when a suicide bomber detonated his explosive around Buhari Housing Estate and Ministry of Housing quarters in Damaturu, the capital of Yobe state. The attack reportedly took place at a mosque inside the estate. It was organized by 3 young boys. Another source said the suicide bomber came near the mosque, hugged one of the boys around and blew up himself and others at the scene. The attack injured 10 others. The fight against Boko Haram (BH) insurgency in our beloved nation can be divided into two main parts: The Government Role and the People’s role. The federal and state roles are the Military campaign and economic development of the Northeast region. But the public or the People’s roles are public enlightenment, religious roles, and by reporting any unusual or suspicious activities to the approprate aurhority or law enforcement. BH insurgency in Nigeria will soon become history if both the government and the people play our role effectively to destroy their roots. The government role should do more than just bombing and ground attack of the BH forest hideouts. Hoewver, the public roles are crucial for quick victory over these animals in human flesh; public enlightenment programs by Islamic leaders, teachers, mothers and fathers is a must to defeating this terrorists. The people must report any unusual activities to police or other law enforcement officers, and the Islamic scholars must play a crucial moral role by teaching all their youth that he any one who fight along sidethe BH will go to hell. The Imans, Muslim students,and other Islamic groups in that region and Nigeria at large must publicly condemn this evil act of mass killing, bombing of mosques and churchs, and destruction of properties without any fear of retaliation from BH. BH war cannot be won by Military campaign alone, but by all concern Nigerians from very part of the country mostly the affected region. So far, Nigerian army are doing a good job dismantling their hideouts and killing the terrorists like never before seen in the past six years. The Military must cut off their food supply chains to their hideouts in those forests at all costs. Nigeria is at war for the past six years and that should be a thing of great concern to all peace loving Nigerians (Muslims and Christians alike). How can the military stop, deter or detect those three brainwashed young boys that bombed and killed their fellow Muslims in a mosque in Yobe yesterday ? It is almost impossible task but with public involvement that can of attack can be stop. Why? The Holy Bible says, “Human mind is extremely wicked, who can know it?” The general public should rise up to the challenge by reporting any unusual or criminal activity to the appropriate authority. The federal government should provide easy mean or way through which people can report unusual activities without revealing their true identity. The govt. should also invest in poultry, agriculture, small farming and minerals exploration in that region to occupy those jobless youths in the Northeast region. The government should use BH tactics by recruiting spies among the northern youths to observe, spy,and report any unusual or suspicious finding directly to the Military or designated recipient. We must pay these youths reasonable amount of money for the spy jobs; federal government must begin to recruit those youths in secret, protect their identities; and recruit them into military or Nigerian Police Force after the total victory over Boko Haram. Why? Because we do not have enough and properly trained police officers in our society today compare to our present population. So far, I’m proud of the effort made by President Mohammed Buhari and Nigerian Military, but we must all ( General Public, Army, State and Federal ) step our efforts to destroy BH which have killed more Nigerians than than anytime since the end of the civil war.May God continue to empower PMB, vice president Osinbajo, Our Military Chiefs, our men and women in uniforms and all peace loving Nigerian people. Amen.